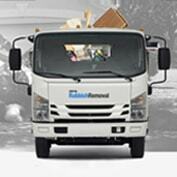 Our rubbish removal service is focused on providing high-quality service and customer satisfaction. With 17 years’ experience in Sydney and excellent references we’re sure you’ll be happy working with us. We offer a competitive obligation free quote, prompt same day service and we turn up when we say we will! We have been removing rubbish from Sydney homes and offices and have never met a challenge we couldn’t complete. No job is too small or too big or too difficult. We are familiar with working with all council regulations regarding the safe disposal of goods, work closely with body corporates and strive to minimise disruption to you and your neighbours. We guarantee a stress-free, simple and professional service. Guaranteed cheapest rubbish removal service in Sydney!